Tideline Gallery carries an extension selection of functional pottery from several American artisans. Bill Campbell has been a potter for 25 years. Across the country, his porcelain is admired for its spectacular color and elegant, crisp forms...each piece maintaining some of the energy of its creator. The glazes dance with surprising vibrancy in unexpected patterns. Functional pots become little moments of celebration within the day to day routine. 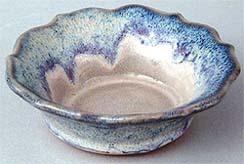 Bay Pottery's pieces are designed to be beautiful and functional. Made with the finest materials and high fired to 2,300 degrees F., their unusual creations feature their own unique reduction glazes painstakingly formulated during twenty-five years of making pottery. Bay Pottery has become a favorite among crafts enthusiasts who especially love their many clever holders and vases which are so useful in the home and office. Together, Ray & Susan Allen have over 60 years experience designing and handcrafting functional stonewear pottery. Their work is distinctive because they have developed a style that is uniquely theirs and a glaze palette of colors that fits into any home.